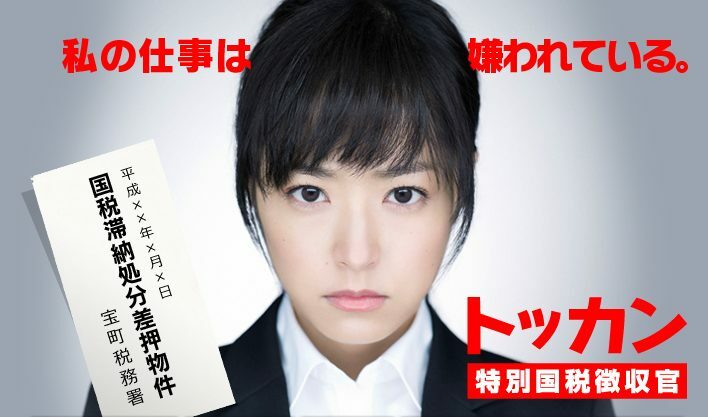 Miki Suzumiya (Mao Inoue) begins work as a tax collector at the Tokyo National Tax Service. Miki Suzumiya wanted to become a public officer because she thinks it will be a stable job. She soon finds herself very busy collecting from delinquent taxpayers. Miki Suzumiya goes to the home of Minagawa, because he hasn't payed taxes for the past 6 moths. Miki faces strong resistance from Minagawa and his wife Mariko (Hitomi Sato). When Miki can no longer stay and is about to leave,her colleague Yuko Nabeshima (Sawa Suzuki) and a strange man appear. The strange man is Masachika Kagami (Yukiya Kitamura), a special tax collector designated by the National Tax Service and called a Totkan. He mercilessly enforces execution of the attachment. Miki's boss Chojuro Kaneko (Tetsuhiro Ikeda) later tells Miki to follow Masachika and she does so reluctantly. Based on novel "Totkan Tokubetsu Kokuzei Choshukan" by Madoka Takadono (published on June 24, 2010 by Hayakawa Publishing Corporation). Avash Jan 04 2015 11:21 pm I really love the act from Mao Inoue さん　!! jk Feb 21 2013 12:29 pm Mao-chan is super funny and so is Kitamura-san! jefferson Feb 05 2013 11:55 am i love Inoue! joy Aug 04 2012 10:23 am mao why ur so cute? keinoryuu May 11 2012 11:36 pm finally, Mao-chan on dorama!! !